Two goons, Dave Catania (Silva) and Frank Webster (Strode) are sent from New York to Italy to kill a small-time pimp named Luca Canali (Adorf). Helping out the two men is Eva (Paluzzi). Luca seems to be outsmarting his killers at every turn so the whole situation escalates and Don Vito Tressoldi (Celi) is not happy. Claiming Luca is starting a war, and he “doesn’t want to be beaten by a loser”, Tressoldi cruelly ups the stakes by attacking Luca’s family. Now Luca is out for revenge, as opposed to just deflecting all the attempts on his life. Will he succeed? Fernando Di Leo cranks out another winner here. Milano Calibro 9 (1972) is better (though it’s always open for debate) but La Mala Ordina, as it was known originally, is a very strong movie as well, with its masterfully shot and edited climax (like the rest of the movie), a similar sense of toughness, the decor, the style, and of course, the movie highlight, the car chase. 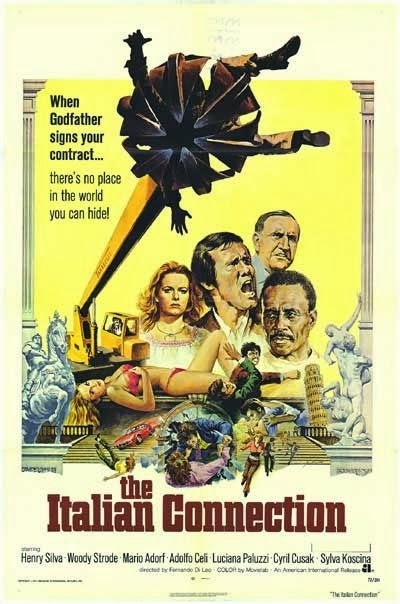 The chase, along with a fairly tenuous connection to a heroin shipment (it’s not mentioned very much in the movie), were obviously the catalysts to retitle this movie in the wake of the success of The French Connection (1971). Adorf, who also put in a great performance in Milano Calibro 9, excels in the lead role of Luca Canali. It was wise to put Adorf out front, even if it seems now like an obvious choice. Henry Silva is kind of a fan favorite even though he doesn’t have any facial expressions. But his hair is better here than we can remember anyplace else. His partner, played by Woody Strode, seems a bit out of sorts, but Di Leo thought enough of him to put him in The Violent Breed (1984) later on in their careers. Three well-known beauties of the day, Luciana Paluzzi, Femi Benussi and Sylva Koscina are on hand to make things more interesting, as is Cyril Cusack as a mob boss. The whole thing is topped off with one of Armando Trovajoli’s funkiest and best scores. There’s also a certain counter-cultural element at work here which would be fleshed out more completely in later Fernando Di Leo films, most notably Avere Vent’anni (1978). The underground culture of the day is a recurrent theme in Di Leo’s movies and found its way into whatever he was working on, regardless of the genre. This sets his movies apart to a certain extent and it’s fascinating to see, simply as a document of the era. If you have seen and liked other Di Leo movies, you will certainly also like The Italian Connection (if you see the Raro DVD that is, not one of the innumerable cheapo VHS releases). If not, this is as good a place as any to start, mainly because there’s nothing really NOT to like about this fine film. Also check out a write-up by our buddy, Ruthless Reviews!